The Crab lands have fallen, and the Scorpion lands are besieged. The Empire’s war with the Destroyers approaches its final, feverish days. When the dawn finally breaks, and the war is concluded, will the sun rise upon the Emerald Empire, or only upon a suffering ruin once known as Rokugan? 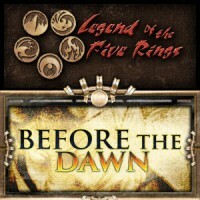 Before the Dawn is an expansion for AEG’s fan favorite Legend of the Five Rings Collectible Card Game and the first that will be legal with Emperor Edition, the new base set, releasing in 2012. Influence the fate of your Clan and the Emerald Empire with your decisions. This is a time of legends, and you can become one! 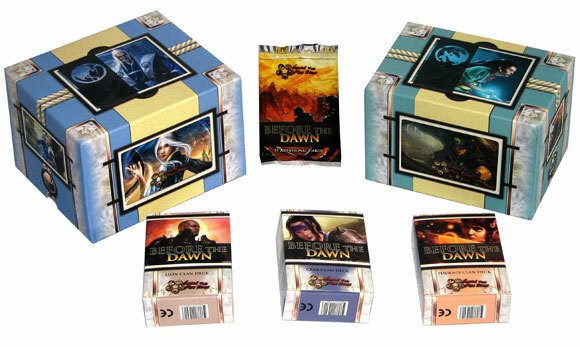 Featuring Crab, Lion and Phoenix Clan starter decks. 156 total new cards expanding your L5R experience in the Celestial Edition arc and preparing you for Emperor Edition. Amazing art, bringing the Empire of Rokugan and its characters to life. The final chapter of the Empire’s fight against the armies of the champion of evil – Kali-Ma the Destroyer. Add a Review for "Legend of the Five Rings – Before the Dawn"